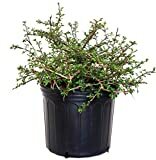 Cotoneaster lacteus growing shrub‎ of the genus Cotoneaster also known as Late cotoneaster, Cotoneaster lacteus perennial evergreen used as ornamental hedge plant or bonsai, can grow in temperate climate and growing in hardiness zone 7-9. Leaves color green to dark green in ovate shape. Flower color white, small flowers have 5 petals and the flowers grow in clusters. Fruit not edible the fruit color is red, the small and grow in autumn.